is a type of intense sandstorm commonly observed in arid regions throughout the world. They have been observed in the Sahara desert (typically Sudan), as well as across the Arabian Peninsula, throughout Kuwait, and in the most arid regions of Iraq. 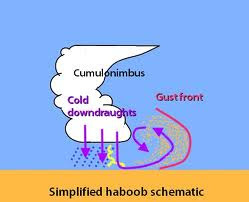 African haboobs result from the northward summer shift of the inter-tropical front into North Africa, bringing moisture from the Gulf of Guinea. Haboob winds in the Arabian Peninsula, Iraq, and Kuwait are frequently created by the collapse of a thunderstorm. The arid and semiarid regions of North America – in fact, any dryland region – may experience haboobs. In the USA, they are frequently observed in the deserts of Arizona, including Yuma and Phoenix,[ as well as New Mexico and Texas. Due to its large area and variations in elevation the state has a wide variety of localized climate conditions. In the lower elevations, the climate is primarily desert, with mild winters and hot summers. Typically, from late fall to early spring, the weather is mild, averaging a minimum of 60 °F (16 °C). November through February are the coldest months with temperatures typically ranging from 40–75 °F (4–24 °C), although occasional frosts are not uncommon. 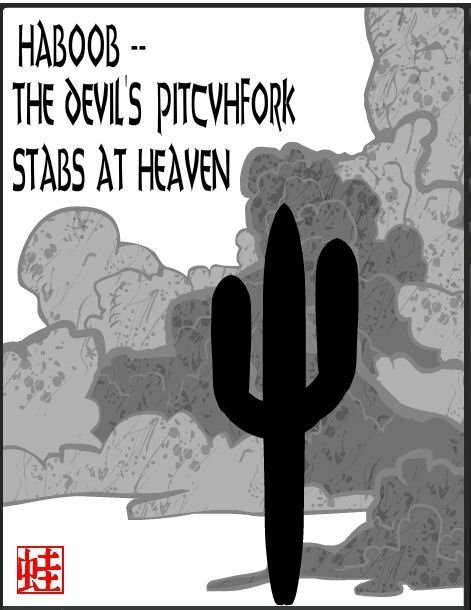 Due to the primarily dry climate, large temperature swings often occur between day and night in less developed areas of the desert. Both times we could see the giant dust storm forming in a huge cloud that advanced across the desert stretches between Tuscon to the south and Phoenix north of Tuscon. We were eventually engulfed in rolling dust-- a cloud 3,000 feet high and 60 miles long.
. Storms and gales, winter storms .